Over the course of the last year, NACTO’s Green Light for Great Streets project explored structural challenges facing transportation agencies, and uncovered the patterns and opportunities that cities often use to get more done, faster. 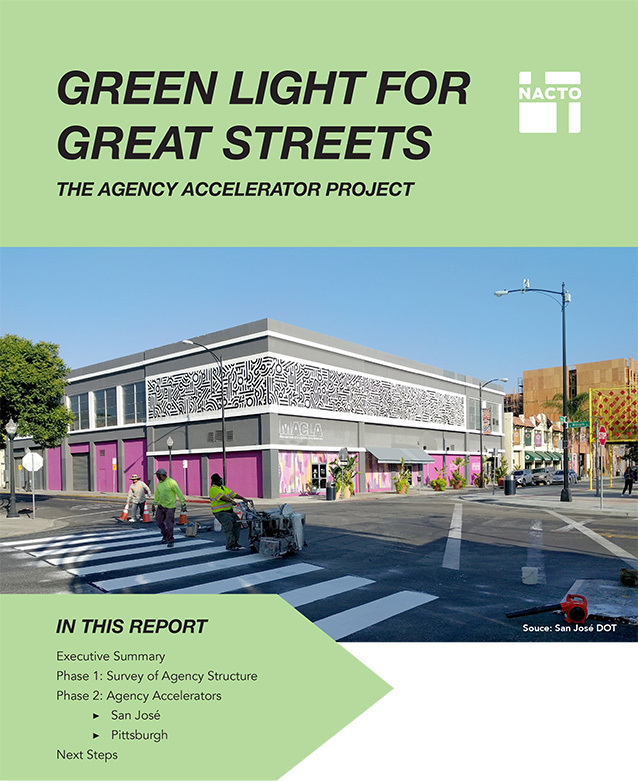 From May 2017 through June 2018, we conducted a comprehensive assessment of the responsibilities, capabilities, and resources of transportation departments across the U.S., and did in-depth “Agency Accelerator” work in two NACTO member cities, San José and Pittsburgh. The results of both phases of the project are summarized in NACTO’s 2018 Green Light For Great Streets report (pdf). Defined and clear processes for implementation, and well-informed staff. Recurring or guaranteed funding sources. Project pipelines built around standardized designs that allow cities to expedite work. A strategic use of consultants to bolster efforts or train on unusual skills. A clear vision, strong political will, and defined metrics for success. With these findings in hand, we worked closely with the San José Department of Transportation (SJ DOT) and the Pittsburgh Department of Mobility and Infrastructure (DOMI) to tackle a specific organizational hurdle. When the Green Light project began, SJ DOT was gearing up to do public outreach about Better BikewaySJ, a large-scale rapid build-out of protected bike lanes in Downtown San José. Their challenge was how to design a marketing campaign for the project that would most resonate with local residents and therefore minimize backlash about implementation. We worked with SJ DOT to develop and disseminate a survey to understand what marketing messages would work best to promote Better BikewaySJ, and to craft an engagement strategy to help message the Better Bikeways project during the early stages of implementation. In Pittsburgh, leadership at the newly created DOMI was in the early stages of realigning existing staff and office cultures and developing processes for getting work done in a new agency. Interested in being more effective at balancing new project ideas with backlogged project needs, Pittsburgh wanted to create a well defined system for prioritizing projects every year. Through two in-person workshops with Pittsburgh staff and interviews with seven other cities about their prioritization systems, we worked with DOMI to build a preliminary process for prioritizing projects that they put to the test ahead of the 2019 budget cycle. City project prioritization processes can be grouped into one of three paths, depending on local and political context. As a result, project prioritization is both an art and a science, and no one model guarantees success. A strong vision from the top is at the core of successful project prioritization. In Pittsburgh, ongoing and upfront communication across key agencies proved to be critical for developing buy-in on the project prioritization process. In San José, safety was consistently ranked as the most resonant message to convey the value of bike lane projects. In San José, the online survey captured a more diverse set of respondents than in-person surveys at public meetings. “Working with NACTO and connecting with our peers has shown us a number of strategies to balance the need for recurring investments with our strategic goals. We are excited to add structure to our prioritization process and to develop a pipeline of projects for a safer, more accessible, and more equitable Pittsburgh,” said Karina Ricks, Director of the Pittsburgh Department of Mobility and Infrastructure. “While it’s one thing to have a bold vision for a transformative project, getting community buy-in and generating enthusiasm is a completely different challenge. But because of the Green Light project, we now have a clear communications strategy for Better BikewaySJ that will help us speak to the needs of our community. We cannot wait to use this strategy to begin the transformation of our Downtown into a more bikeable, accessible place,” said Jessica Zenk, Interim Deputy Director, San José DOT Planning and Project Delivery. We are thrilled to have brought the project prioritization process in Pittsburgh and the marketing strategy in San José to the point of implementation. The renewed strategic project focus in Pittsburgh and the large-scale transformation of San José’s downtown will have enormous benefits for all street users in both cities. We look forward to continued work with Pittsburgh, San José, and other cities to further explore how organizational decisions impact project delivery, and expand cities’ ability to build safer, more sustainable, and vibrant streets. NACTO thanks the Ford Greenfield Labs team for funding and providing valuable insights on this work, our gracious and enthusiastic city partners in San José and Pittsburgh, and the innumerable people we spoke with throughout the NACTO network who shared their time and knowledge with us in the execution of this project.